Robin Tekwelus Youngblood, Okanagon/Tsalagi, is a weaver of many worlds ~ a bridge between indigenous and modern cultures; between the past and the future. 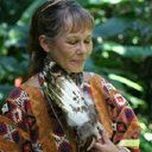 She is a shamanic practitioner, teacher, author and artist, as well as a recognized healer. Whenever you dance Wherever you dance Dance to heal the earth! “Dancing is power. Dancing is prayer. Some say that all is dance. Now there's a big dance coming, a Dance to Heal the Earth. Soon this dance will be done in a big way, in the old way, on sacred ground. All living things will take part. Dance to Heal the Earth! Let your feet beat a healing rhythm into the earth. Let your feet beat a strengthening rhythm for those who struggle the hardest. Let your feet beat a life-giving rhythm for all peoples, regardless of race or national boundary, regardless of whether we're human or whether we're the trees, the air, the fish, the birds, the buffalo, the bear, the crow. Join us for a day of Earth Dance Ceremonies and teachings. We will listen to the Songs and Rhythms of the Earth; the Elements; Animals; Plants, and Stone People. As we hear the messages our Relations have for us, we will fast and Dance to Heal the Earth and Weave the Web of All Life. It’s Time! We are the ones we’ve been waiting for!! Remember your prayer-song ~ Dance and pray. Whenever you dance, dance to heal the earth. Not just when you're dancing, but always. Live the dance, whenever you move, in all you do, dance to heal the earth. Dancer’s Protocols will be sent soon. Dance regalia will be long dresses for women dancers, long skirts (sarongs) for male dancers. Colors for the Dance are Blue, Green and Purple. Everyone may make prayer flags in the Seven Directions colors, to be hung on the tree. Supporters are those who pray for the Dancers, and take responsibility for the community needs during the dance. Supporters may dance, too, outside the central arbor. Women Supporters must wear long dresses skirts and a light shawl. Men may wear t-shirts and long pants. Food will be potluck throughout the weekend. Dancers will fast from food during the Dance, water will be supplied. Prayer Flags: 1 meter each of Yellow, Red, Black, White, Blue, Green and Purple cotton material. Put a handful of tobacco with your prayers in the center of each length of material, then fold the material in half and tie a strip of material one meter long by 2” wide around the material to hold the tobacco inside. The tie will be used to tie your prayer flags onto the Tree of Life in the center of the Dance Arbor. Fasting ~ No food from midnight prior to the Dance until the Feast after the Dance. Water will be provided between the rounds of the dance. Rounds ~ Dancers will dance for five ‘rounds’, each lasting about an hour, with breaks in between for teachings and rest. 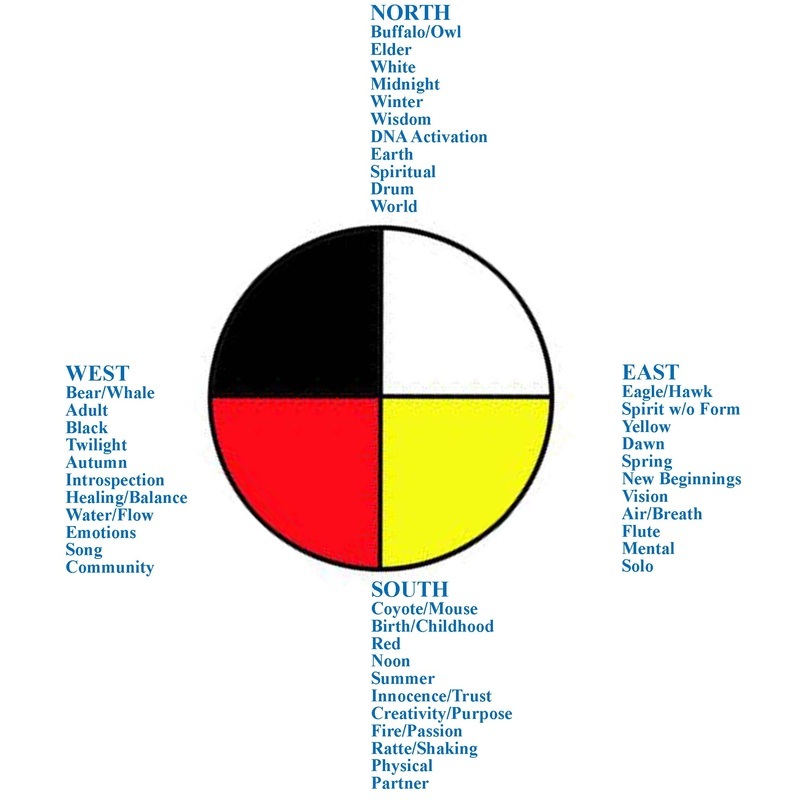 Each round will honor the intentions of a different direction of the Medicine Wheel, i.e., East – New Vision/New Beginnings/Personal Journey; South – Life Passion and Purpose/Partnerships/Family; West – Healing and Introspection/Dreamtime/Community; North – Ancestral Wisdom and Connections/DNA Activation/World; Fifth Round – Above/Below/Center – Integration/Connection and Alignment with Divine, Mother Earth, and Core. 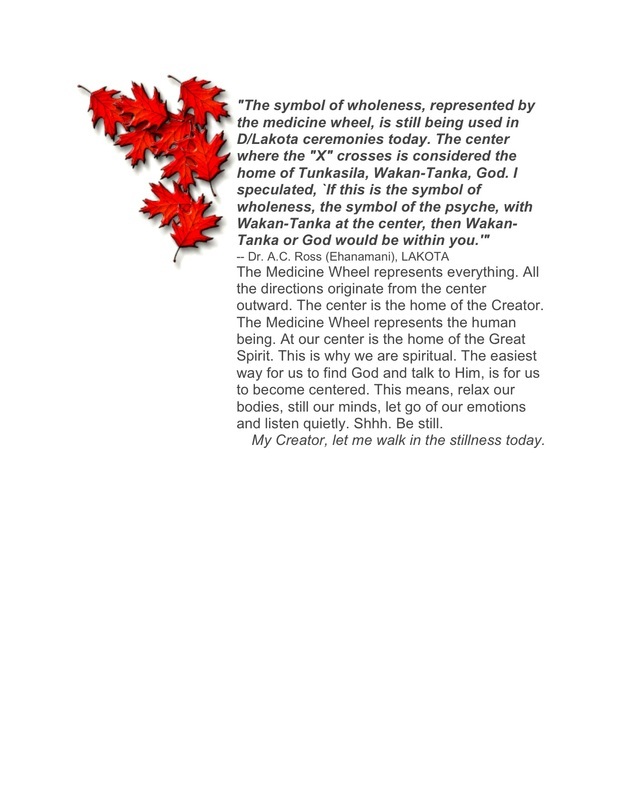 Arbor ~ The Dance Ground and Sacred Medicine Wheel Honoring the Four Directions. Medicine Wheel ~ The Medicine Wheel is made of stones that represent Mother Earth. It is created to honor the Four Cardinal Directions of the Circle of Life, with the meanings detailed above under Rounds. We dance in the Arbor, which is a Medicine Wheel, surrounded and protected by our Ancestors, Guides and Helpers. The Medicine Wheel is also a hologram ~ as Above, so Below. What we intend, offer in gratitude and celebration through the Dance, becomes manifest in our reality as we live our daily lives. Tree of Life ~ The Sacred Tree represents the Axis Mundi, our connection to the Above, Below, and Central Core of our beings and of Life. The Tree is rooted (grounded) deeply in Mother Earth, who gives us Life. The branches of the Tree rise to Father Sky, our Creator, and align us to the Perfect Divine Blueprint from which we are all created. The branches also symbolize our connection to our Ancestors, the Star Nations, and All That Is. The trunk of the Sacred Tree represents the Center of our Beings, and that of all Creation, where all that happens is integrated and expressed in the physical planes of our reality. Dancers ~ those who choose to fast and dance within the Arbor, joyously giving of themselves in celebration, dancing their prayers into the Earth and Sky. The dancers offer their bodies in a form of ‘sacrifice’ (sacred offering), in gratitude for Life and All That Is, as well as in supplication, asking for guidance and clarity about who they are, what they incarnated for, and how they are to serve the Greatest Good. Dancers are in the Spirit World during the dance, and do not speak or interact with Supporters and Guests unless the Intercessor calls them to for some reason. Dancers do not leave the Arbor area except to go to the bathroom (with a Helper) from the start of the dance to the finish. Supporters ~ Supporters take care of the Dance Grounds by helping to build the Arbor and take it down after; attending to the Sacred Fire; gathering wood for Fire and Sweat Lodge; cooking food for other supporters, guests, Teachers and Dance Leaders; making sure the bathrooms are clean, and taking care of the physical needs for all those present. Supporters and Guests are asked not to interact with Dancers directly. If there is a need to interact with a Dancer, the request should be taken to the Lead Man or Woman Dancer. Intercessor ~ Grandmother Robin Youngblood leads and facilitates the Dance to Heal the Earth. Lead Man and Woman Dancer ~ Primary Helpers, lead the changes in the Dance in each Round; assist the men and women who are dancing when they need something between Rounds. Lead Drummers ~ Two Lead Drummers take turns sharing songs and drum rhythms to support the Dancers dance. Anyone else who would like to drum must talk with the Lead Drummers and receive permission before drumming. Teachers ~ Wisdom Gathering VIPs are invited to share a short teaching (15-20 mintues) with the Dancers, guests and supporters between Rounds. All teachings should have to do with helping to heal Mother Earth/Father Sky and All Our Relations, or be pertinent to the Direction the Dancers just honored (i.e., East, South, West, North). Prayer Flags will be removed by those who placed them on the Tree immediately after the Dance, and may be given to the Lead Man and Woman Dancer to be burned at the Sweat Lodge. This is important! The Prayers must be completed by burning the Tobacco in the Sacred Fire. Sweat Lodge ~ Dancers will have a one round Brush-Off Sweat before and after the dance. The purpose of the initial Sweat is to Brush Off worldly energies, cares and worries. The Sweat at the end of the dance is a Gratitude Lodge, in thanks for all the purification, manifesting prayers, and to share the experiences of the Dance. Prayer Flags will be offered to the Fire at the end of the second Lodge. Guest, supporters and teachers may be present to share in this last prayer. Feast ~ The entire community then gathers for a Feast, celebrating the Dance, the Dancers, and the completion of the Prayer. A Closing Circle Ceremony completes the Feast.